I'm getting married in just under two weeks, and my diet is not going to plan. At first I was convinced I had it in the bag; I'd hit the gym a few times a week and chow down on nothing but salads and by the time the big day came around I'd have a footballer's physique. But, all too often, temptation has got the better of me. The allure of my sofa always sounds a lot more comforting than the treadmill, and a pint of lager ever-so-slightly more appealing than a cup of green tea. 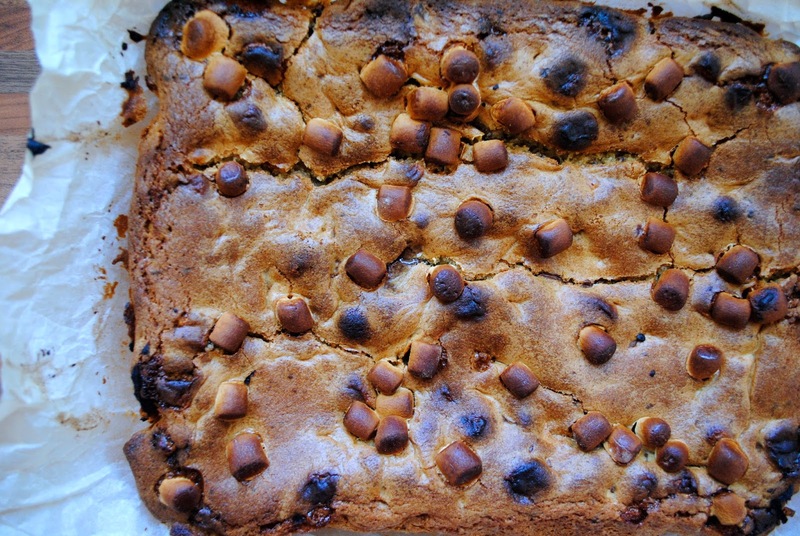 And so, rather than do the difficult thing and overcome my obstacles I, like some sort of chubby coward, threw in the towel completely and decided to whip up a tray of blondies. Don't worry about it - I'm definitely going to the gym tomorrow. Great recipe this - very little effort as well so you're not even burning calories as you make them. Oh well. Start by creaming 225g of unsalted butter with a cup of brown sugar and 1/2 a cup of caster sugar. Give it a few minutes with a whisk or electric mixer, until it's nice and smooth, then add 3 eggs and a couple of teaspoons of vanilla extract and stir it all together. In a separate bowl sift your dry mix - 2 cups of plain flour, 2 teaspoons of baking powder and a pinch of salt - then stir into your wet mix. And this is where it gets fun, and often out of hand. I added about 200g of white chocolate and about 200g of dark chocolate - smash it to pieces, some big some small, and stir through the mixture. 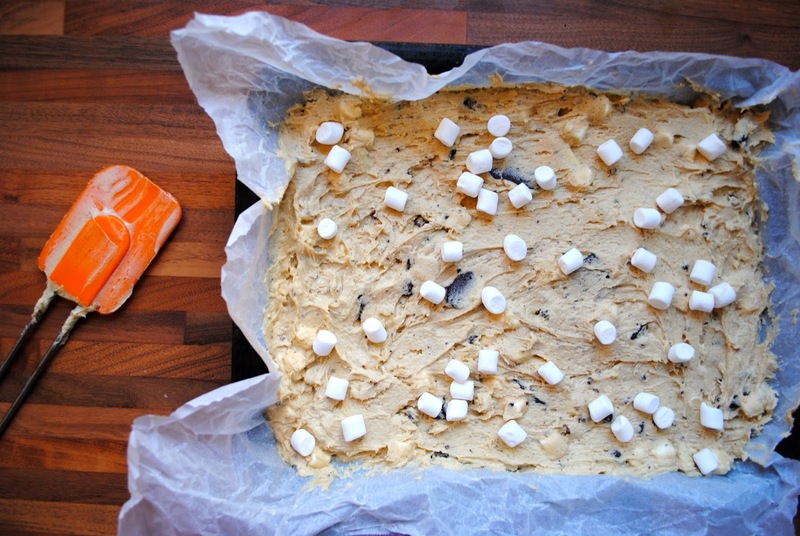 A couple of handfuls of mini marshmallows complete the look, then pour your mixture into a baking pan that's lined with parchment. Top with more marshmallows because...well because in my line of work I've found that more is always better. 175C for 30mins - no more, no less. If you want a nice gooey middle (and who doesn't want a nice gooey middle?) make sure you don't overbake your blondies. Leave in the pan to cool slightly or else you'll get loads of cracks running through your blondies. Take a look at mine. Guess what I forgot to do? And your blondies are done. Sit back, pour yourself a nice glass of milk and go to town on a couple of these. Sure beats the gym.